For the smallest province in Canada the approach to it is awesome. 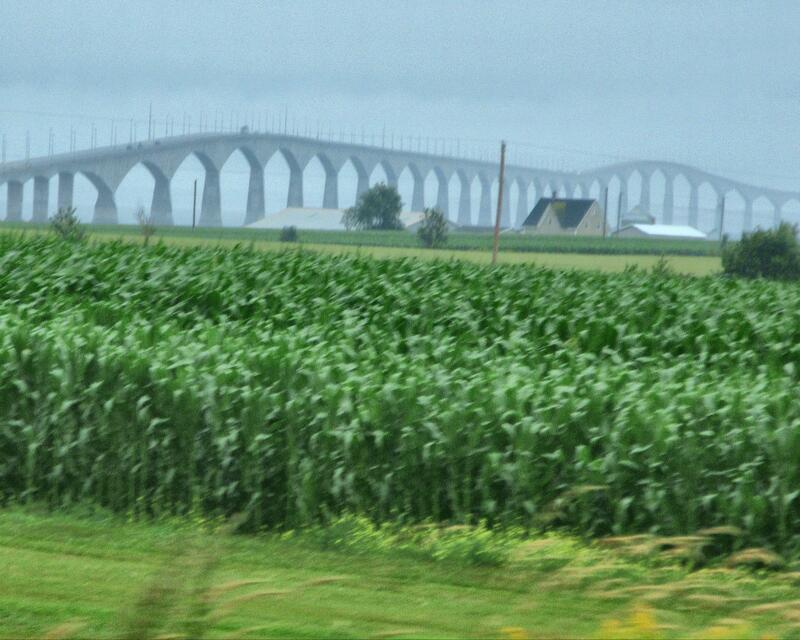 The Confederation Bridge spans almost 13 kilometres of the Northumberland Strait connecting PEI to the mainland, an impressive start to our visit to the land of my favourite food group, the lowly potato. The Dude scoffs at my potato fixation. He dreams of silky bowls of seafood chowder, a staple on the Island, along with breathtaking views, verdant hills and farmland with crops so lush and healthy and perfectly groomed it looks like a movie set for “The Stepford Farm”. We set our sights on Charlottetown, the birthplace of Canadian Confederation. Oh yah, people, this is where it all began, that meeting that begat what Canada is today; a hockey-loving, Tim Horton’s coffee guzzling, touque-wearing bunch of folks who say ‘Eh’ a lot, who are for the most part polite (with some exceptions, I’m talking about the snotty clerk from Quebec City) and envy some aspects of the USA but are secretly glad we aren’t them. 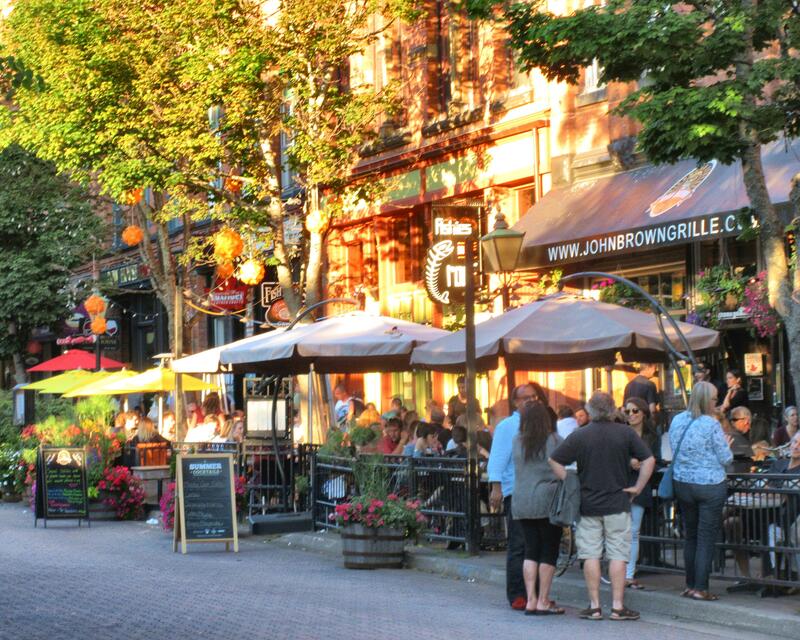 Charlottetown has a happening downtown with busy restaurants, theatres and touristy shops vying for tourist business, which is apparently booming based on the packed dining terraces we pass. Two things drive the tourism business here, a fictional red-headed heroine and the love of ice cream. Anne of Green Gables trinket shops abound. Apparently the ginger-headed pixie’s legacy includes candy pusher. Her chocolate emporiums can be found everywhere, chocolate-covered potato chips anyone? 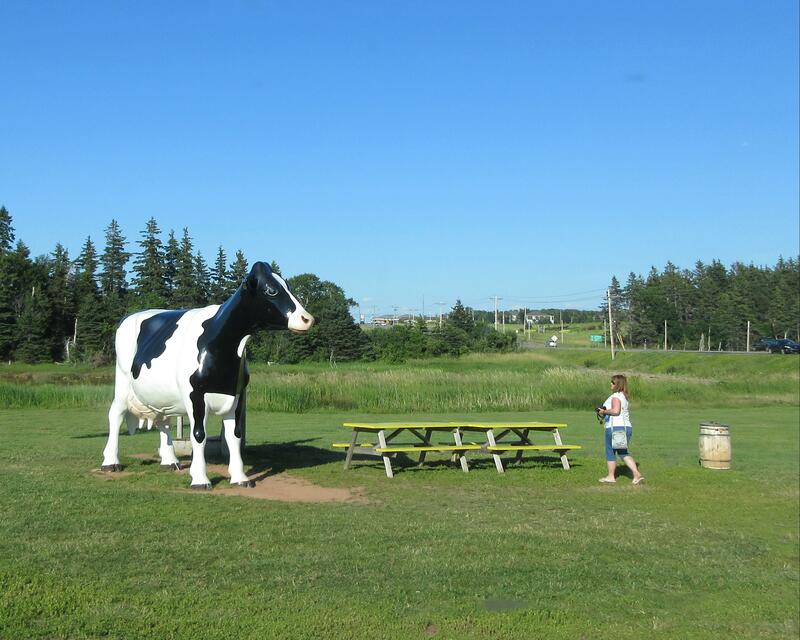 If you are strolling around PEI and suddenly find a giant bovine in front of you, a Cows franchise won’t be far away. Pumping out pricey cones with cutesy names like Mooey Gooey, Don Cherry (yummy), Fluff n’ Udder (might wanna’ rethink the optics of that name) Cowberry (again people, visuals!) 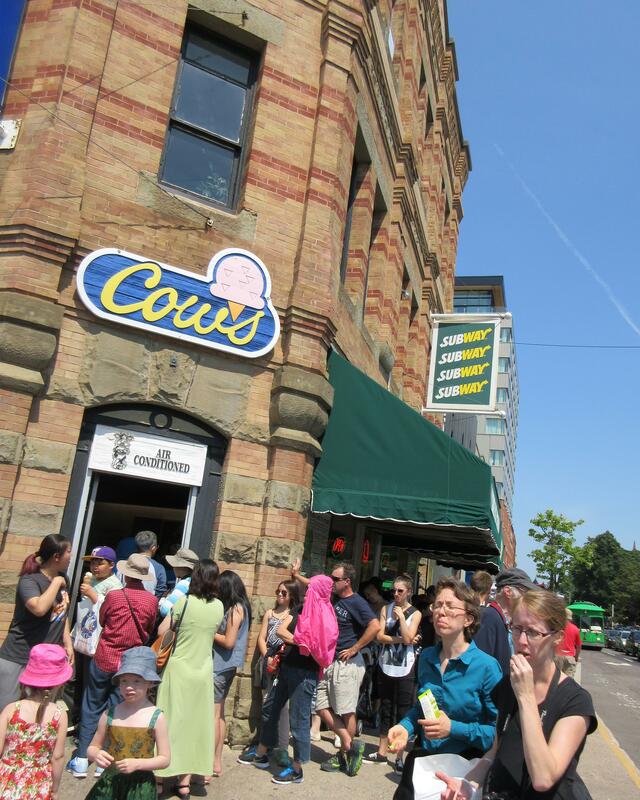 the ice cream empire is moo..ving right along (a cow pun, how unexpected). 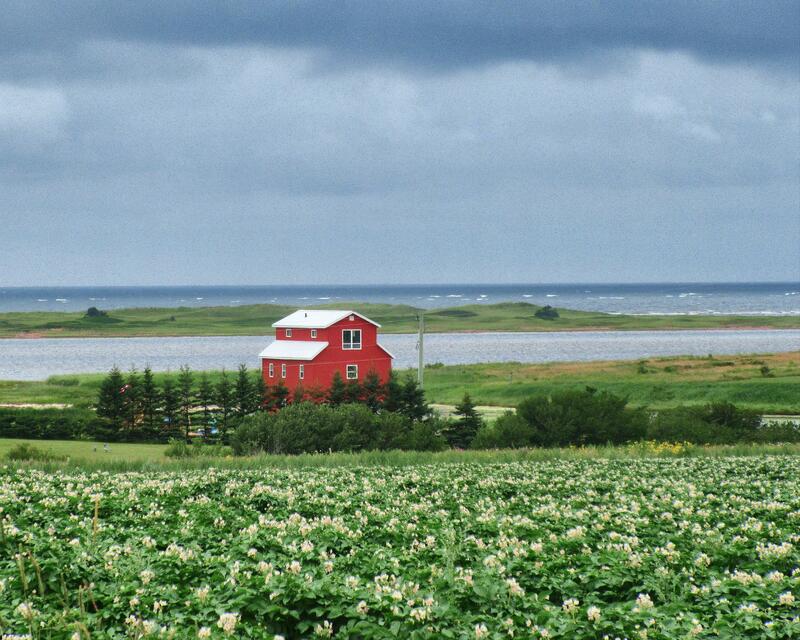 PEI is the ultimate road-trip province. Highways, little more than country roads, criss-cross the province. The GPS, always looking for the shortest route, constantly chirps instructions to turn left on an unpaved road. These usually end in heart-break with the Grey Ghost, so we’ve learned to ignore her and wait for the “recalculating” to kick in. 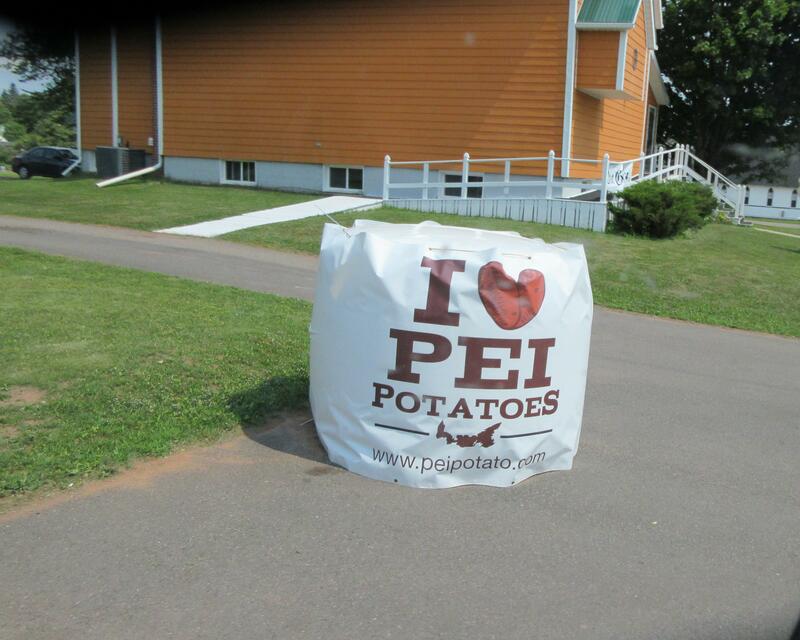 Despite the tourist trappings that are an economic necessity here, PEI feels homey. It’s so damned pretty and peaceful and has such beautiful vistas that we start having The Talk. You know the one– you’re on vacation, you end up at a great spot that feels warm and welcoming, the food is good, people are great… so you start imagining what it would be like to live here, not full-time mind you, but part of the year, real estate is cheap. Yadda, yadda, yadda. I remind The Dude about his boredom threshold and what is involved with potato farming or running a Cow’s outlet. 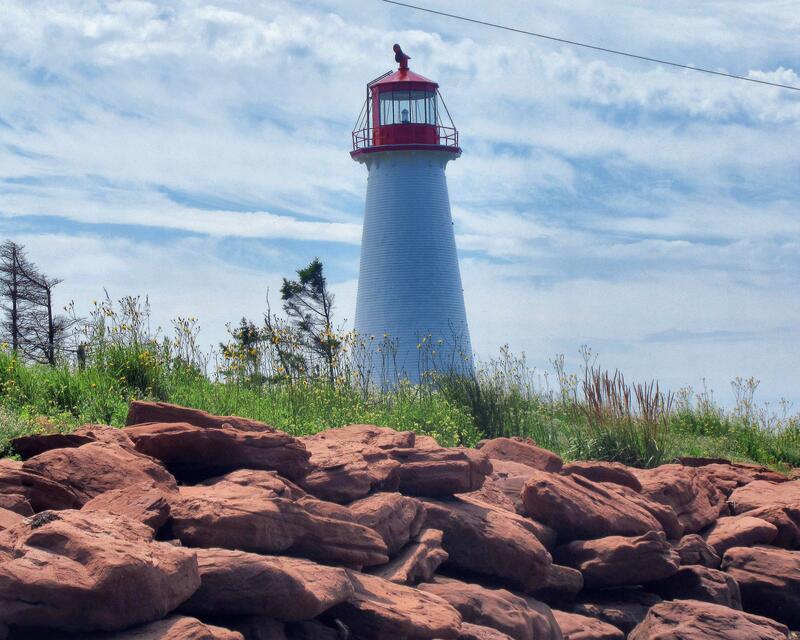 Befitting an ocean-locked province, lighthouses oversee every other cape. The Dude feels about lighthouses much like he does about churches, after about the fifth viewing, fatigue takes over. He manages two, persuaded by the promise of a seafood lunch for good behavior. We are cautiously optimistic after the New Brunswick Wonderbread fiasco. 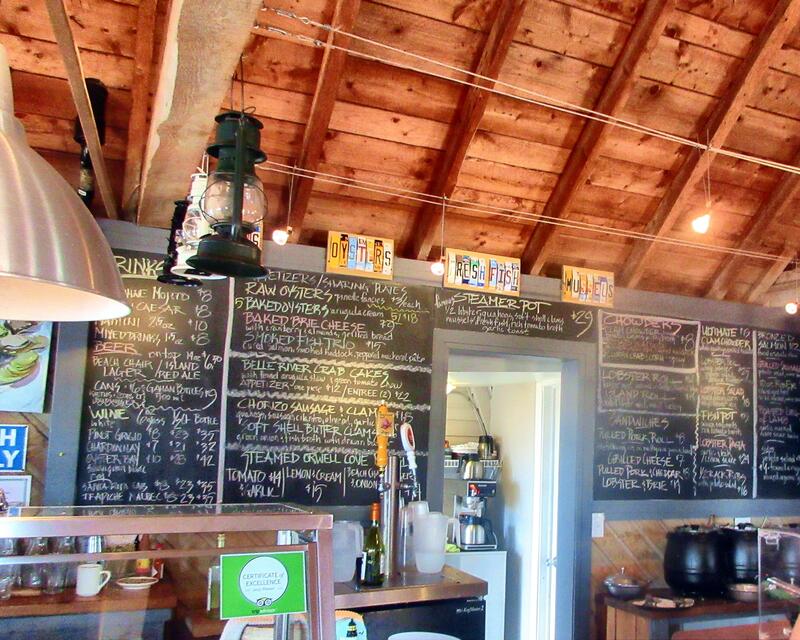 We enter the Chowder House to discover good sign #1, a table of weathered locals. If every table is filled with sunburned tourists and the menu has fun names for food items, run, immediately. Good sign #2, the menu is on a blackboard listing items with clever descriptions designed to change your mind at least three times before you order. So descriptive in fact, that I order the curried crab corn chowder. The promise of the homemade buns served with it, definitely influenced the decision. I take the seafood plunge at last. The Dude, bent but not bowed by his last lobster roll encounter, orders one again, he is nothing if not optimistic. Optimism is rewarded, maybe this seafood thing isn’t so bad after all. 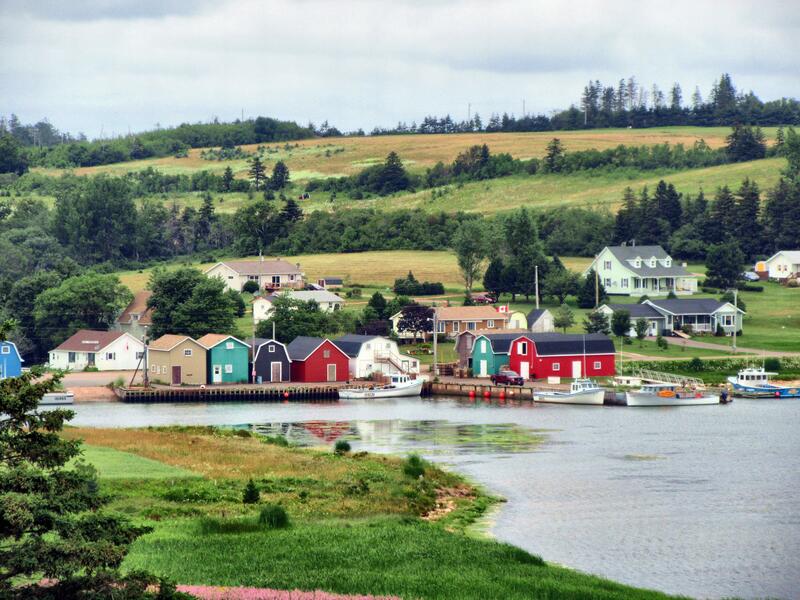 Rolling through the small towns that dot PEI feels like being transported back to the 1950’s. There’s something really homey about the province, despite the tourist trappings. They gotta pay the bills after all. Ice-cream, seafood and of course potatoes, so beloved they named their radio station SPUD FM. How can you not love this place. ← What’s with the Wonderbread? Enjoying the blog. It’s finally raining here. Lee showed me the “meanderings” last night and I spent the morning reading about your travels. Really enjoyed the commentary of your travels so far, I will continue to follow as your road trip carries on. Wishing you safe travels.